The Dutch yacht building industry has developed new regulations for the construction of yachts bigger than 12 metres, for commercial use. (such as chartering). These rules, introduced in the month of May this year, are called rules for Commercial Cruising Vessels, the CCV rules. This new development makes it possible to fly the Dutch flag on larger yachts. HISWA Association, the Dutch industry body, has been the instigator of the project, also supported by the Dutch Maritime Network, which published the regulations. In itself, the project is worked out in a unique cooperation between yards and the Dutch Government, the Netherlands Shipping Inspectorate. The goal of the project is to offer the owner of a superyacht a so to speak "one stop shopping" solution. In other words, the Dutch yacht building industry can offer from now on the whole package to the owner; yacht, safety regulation, crewing and registration under Dutch flag. In this way, the Dutch yacht builders expect to be even more attractive to potential superyacht owners. 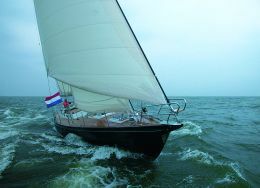 The Netherlands yacht building industry is worldwide known for their high level of craftsmanship. By introducing these new CCV rules, in combination with registration under Dutch flag, the package is complete. As a result, the competitive position of the Dutch yacht building industry will be reinforced on a global scale. Until now, only the British Maritime and Coastguard Agency (MCA) developed rules for super yachts. By making the CCV rules, the Dutch can now offer an attractive alternative. The CCV rules are as much as possible based on existing rules, adapted where necessary for specific application in order to allow and develop alternative solutions in a responsible way. Dutch yacht builders felt constraint in their innovation drive by the inflexibility of rules. The new CCV rules offer more room for innovation in design, construction and operation. The CCV rules apply to seagoing vessels under Dutch flag for commercial use with a length exceeding 12 metres, designed and built for recreational use by passengers, up to 500 Gross Tonnage (GT) For vessels with a gross tonnage of 500 or more, SOLAS regulations are applicable. This 500 GT limit is in fact the only distinction made in the CCV rules. In this respect, the regulations are straight forward and simple. For some aspects however, the CCV rules provide an explanation as regards the rules for vessels of 500 GT and over. An example of this can be found in rules concerning structural fire protection. The reason for this is the special character of superyachts, which is basically different from commercial vessels in the traditional sense like cargoships. In fact, we as an industry must be able to offer the owner a "floating palace" within reasonable legal safety boundaries. Moreover, the regulation for CCV's larger than 500 GT, offers the possibility to use Risk Analysis with regard to structural fire protection. In short, this means that the industry has to prove, on a scientific basis, to meet fire safety standards. In this way, alternative and innovative materials and constructions can be approved. The Dutch industry is now working on an acceptable method to reach this goal. The CCV rules are so called "statutory rules". The hull, the machinery and electrical systems, the equipment and the rigging have to comply with the relevant rules of Classification Societies like Lloyd's Register, ABS, GL and others. The CCV rules are already part of the Dutch law concerned. Apart from technique, registration, and in relation with this, tax regulation, is of importance. Since a CCV is a commercial vessel, we have to comply with registration and tax regulations as applicable for the traditional commercial sea-going vessels. This means for example that a CCV has to be commercially operated by a shipping company, based in the Netherlands. In this way, no VAT has to be paid on the purchase of a CCV. In cooperation with the government, an operational model has been developed that is internationally competitive. This model is clear from the outset, so every owner, shipping company or yard knows under which conditions a CCV has to be operated. This is important for all parties involved. Being a commercial cruising vessel, we also have to comply with national and international regulations (like STCW) for crew. This is nothing new, and offers new opportunities for manning agencies and training institutes in Holland. 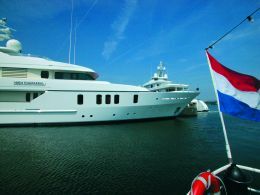 New training will be set up by a maritime institute in the Netherlands, to educate crew for superyachts. This will be a welcome development, since manning a superyacht is not as easy as it might seem. For us as an industry, it is relatively easy to "hook up" with existing maritime training schools. What has to be done is to develop training courses for yacht managers, technical and service staff. It is expected to have things in place at the end of this year. The new CCV rules offer new opportunities for the industry and owners. We hope that many shipowners will opt for these new rules for Commercial Cruising Vessels, which will support the high level of craftsmanship and innovation drive that characterizes the Dutch yachtbuilding industry. The regulations will be evaluated after some time and if necessary adjusted in consultation with the Netherlands Shipping Inspectorate. We expect that this new initiative will lead to more and extended service activities to provide to costumers, like registration, refitting, repair, insurance and crewing. This way, "going Dutch" has its benefits!